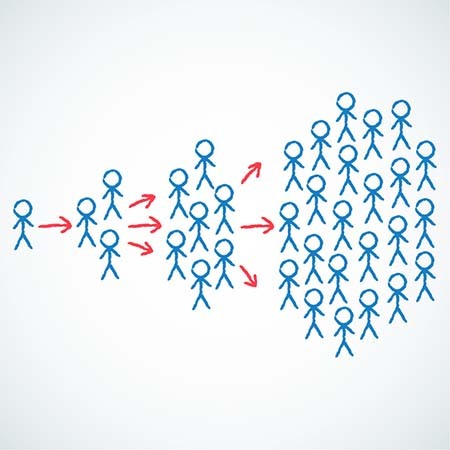 What is Virality? Google best describes it as “the tendency of an image, video, or piece of information to be circulated rapidly and widely from one Internet user to another; the quality or fact of being viral.” So it is the calculation of how many times the information is shared. This is not to be confused with how many times it is seen or read. The most viewed videos on YouTube are all music videos that people sought out to watch. The most viral videos on YouTube are the ones that someone shared with someone else. The higher the number of times people share it using trackable social media (share buttons), the more viral it becomes. Viral messaging has become the advertising of the future. The best way to get your ad out is to create a video that people want to share. Conversely, sometimes things you don’t want shared can go viral, and that can be damaging. It is like a giant global gossip ring, for better or for worse. It is the multi-million dollar question and no one seems to have the exact answer. Jonah Berger, marketing professor at Wharton and author of the book Contagious, says that the more emotionally evoking the content, the more viral things tend to be. A video or image that makes you laugh out loud, makes you mad or makes your heart ache is far more likely to get a share. One that gives you neutral reaction or one that makes you feel badly about yourself are not. Another factor is celebrity endorsement. If a celebrity with a high number of Twitter followers sends out a link then many of his/her followers are likely to retweet that link. Again this can backfire. Plenty of celebrities have also shared embarrassing Instagram photos or made less than intelligent tweets that are now part of their digital tattoo and cannot be removed. On the other side, 2011 was the year of Nyan Cat, a video that went viral and has been seen over 100 Million times. It doesn’t meet any rules at all. It is just odd. How and where do people share? Gone are the days of copying and pasting in a link to pass it on. Sharing is an easy as clicking a button. Most websites now include a ‘share’ badge that will allow you to post a link, image and blurb about what you are looking at, directly to the network of your choice. This is one of the reasons why so many people do it. Examples of most viral content shows up in your newsfeeds on your favourite social networks. If you want to be on the cusp of the latest, several websites like ViralNova, Upworthy and Buzzfeed assemble the best of the best and present it to you. Of course you can chose to share their content back to your social network as well. Are there dangers to sharing? Only in so much that you are assigning your name or profile to that item. So if I share a Buzzfeed article about awesome haircuts from the 80s, that is recorded to the profile I shared it to and used as part of the mountain of data from which it can infer my interests. When I see ads for crimpers, I will not be surprised. Most viral shares of 2013! Time Magaine’s Top Ten Viral Videos They will make you laugh, smile, or shake your head, but here are the most shared videos this year. Note – some have language that is NSFW (not safe for work). If you have not seen it, the Chris Hadfield video from the ISS is really cool. Tumblr has become a major player this year in the social network space. Here are Yahoo’s most viral Tumblr blogs. The blogs are started by one person and then others can contributed to them. Some of these blogs are one person’s art and others are a collective of shared humour. These are all uplifting. The most viral ad is the Dove Real Beauty ad which shows women that they are more beautiful than they think. The majority of the others ads are funny. The Kmart “I shipped my pants“, at #4, is still my favourite. Here is the entire list of Ad Week’s 20 most viral Ads. So, what does all this mean to you? No one can predict what will go viral. But if you do decide to share something publicly, you may wake up one day to fame… or infamy.